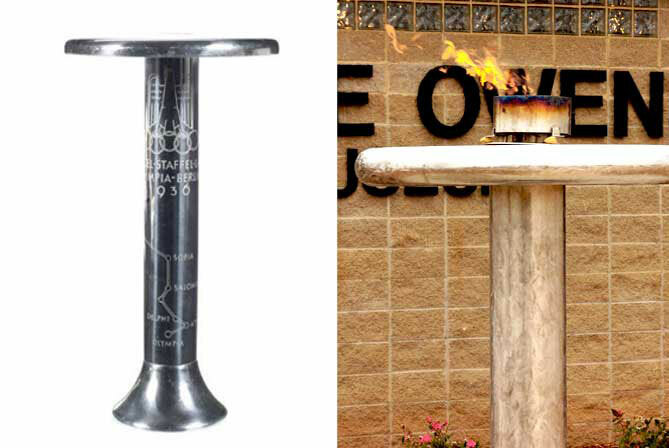 The inscription on the stainless steel torch replica speaks to the purpose of Jesse Owens Memorial Park. To capture the spirit of and commemorate the life of Jesse Owens. Ruth Owens lights the 1936 torch replica at the Jesse Owens Memorial Park and Museum. The 1936 Olympic torch. R- The Torch Replica at the JOMP. The torch was lit by Ruth Owens, Jeese Owens’ wife. 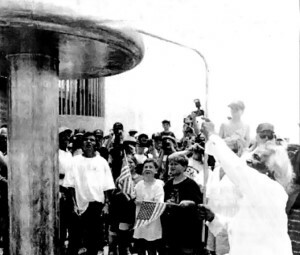 On June 29, 1996 the eternal flame was lit by Owens’ widow, Ruth, from the Olympic torch as it passed through the park on its journey to the XXVI Olympic games in Atlanta. The lighting of the 1936 torch replica was just one of the many festivities and ceremonies of the park’s dedication.